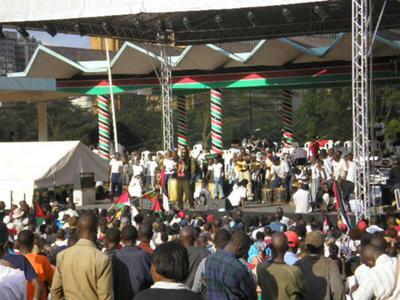 This is the opening ceremony of the World Social Forum in Nairobi in 2007 with speeches, music and dance. The opening took place in Uhuru park - a park where a lot of political rallies are. The World Social Forum (WSF) is an international forum of people and groups who want to change society to make it more equal, to protect the environment, etc. They hold international meetings every few years. The Nairobi event was great. There were 66,000 people present from 110 countries. I was there with some friends from Germany and the Netherlands. The organisation was pretty chaotic on the first day, but after that it went OK.
At first you might not understand the purpose of W.S.F but as you participate you come to realise it's a social platform where there's plenty to learn from different people,cultures and nationalities,from cultural to technology. I was a participant at the Kenya Organic Agricultural Network (KOAN) stand which was one of the busiest stands. I'm an organic farmer at his youth a rare occupation with youths in africa as farming is viewed as a peasants way of life. There were so many activities that I didn't cover a tenth of it but learnt so much and wish to participate on more events. Guess what... I was there too! 66,000 people from all over the world in one place - it was very special! People say the World Social Forum meetings show too little results, but I think the value lies more in meeting new people and seeing how social groups are doing elsewhere.